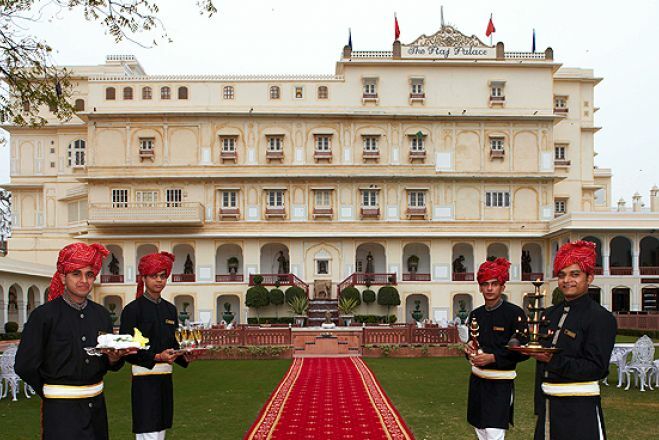 Raj Palace Jaipur Make your day hotel stay enjoyable and comfortable by booking your day stay at Raj Palace Jaipur. Acknowledged as "The World's Best Heritage Hotel", The Raj Palace is a Heritage Grand hotel and the member of Small Luxury Hotels of the world. This exceptional lodging was voted as the “World's Leading Heritage Hotel" by The World Travel Awards consecutively for nine years 2007 - 2016. If you are looking for a real luxurious experience with a true Indian flavor, then, The Raj Palace the right place for you. Enjoy an authentic daycation at the Raj Palace and recharge in one of our day rooms! Jawahar Jala Kendra – Inaugurated on 8 April, 1993, it symbolized the fulfillment of a dream and the beginning of another. The new multi arts centre was perceived as the hub of arts and artistic activities and as a centre for the conjunction of the classical and the folk traditions which would in the years to come cater both to continuity and innovation. Complete your daystay by enjoying one of the multiple artistic show of the Pink City. City Gates – There are three fascinating gates facing east, west, and north. The eastern gate is called Suraj pol (sun gate), the western gate is called Chand pol (moon gate) and the northern gate faces the ancestral fort of Amer. Your daystay would not be complete if you haven't visited all 3 gates! Amer Fort – This scenic place will doubtlessly fulfill your daycation. Erected during the XVI century and declared a UNESCO world heritage site in 2013, this astonishing place will both awaken your senses and gratify your exploration's desire. The Heritage Rooms - Those amazing suites were used for the entertainment of the prince, Thakur Sahib. Each suites has its own soul, its own individual harmony between the finest material, rare woods, silk, brocades, furniture and artefacts created by masters craftsmen. This extravagant marriage of decor will leave you amazed! The Royal Lounge - Thakur Sahib used to meet his officials for meetings and coffee breaks in the royal lounge. The Royal Lounge is fitted with Royal furniture, mirrors and Celebrity museum, it has beautiful arches, decorated in tones of pink, green sand gold, the floor is embellished with Italian marble. Proximity to Airport - Situated only 12 kms far from the airport, you will be able to take your regular flights to most of the domestic locations like Delhi, Bombay, Calcutta, Ahmedabad, Jodhpur, Udaipur or other international destinations.